Make the most of your limited time in Osaka by covering several nearby temples and outdoor areas in one 8-hour private group day trip. 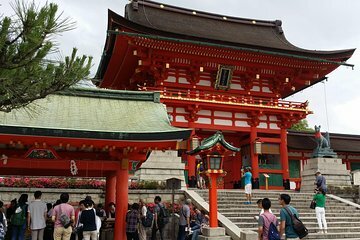 Visit the UNESCO World Heritage-listed Tenryuji temple and explore the red gates of Fushimi Inari, another historic shrine. After strolling the bamboo forests of Arashiyama, you’ll also enjoy an included sushi lunch at a ‘kaiten’-style revolving restaurant. Depart from your Osaka hotel in the morning, heading first to the outdoor area of Arashiyama. Visit the UNESCO World Heritage-listed Tenryuji Temple, and then take a bamboo forest stroll. Continue the day by wandering the grounds of Okochi Sanso estate. Start the afternoon with a walk through Arashiyama’s main thoroughfare before continuing on to a ‘revolving’ sushi restaurant for an included lunch. Proceed next to Fushimi Inari, a sacred complex known for its series of red gates that snake up the mountainside. Then head back to your hotel. For a full run-down of the trip itinerary, please see below. 10:00 am: Arrive at Arashiyama, get oriented. At the foot of the mountains above Kyoto, this district has both history and natural beauty in great abundance. We'll park the car right in the center of town, then set about seeing the surrounding temples, scenery (including a walk along the river), and shops. Explore this World Heritage site, and also said to be the most important temple in the Arashiyama district of Kyoto. Delight at temple grounds, expansive Japanese style rooms, and exquisite gardens. Every season brings different highlights in the garden, as does every angle from which you view it. Relax and enjoy the magic bamboo forest stroll. If time allows, ask your guide for another temple or park area that you are interested. Relax in and stroll about this estate property now open to the public. You'll also have the opportunity to enjoy Japanese tea and snacks (at your own expense), excellent views, as well as just a generally fantastic atmosphere. See a bit more of the hillside, then descend to the river by way of a spacious park. From there, a five minute walk along the wide river brings us to the main shopping street. Poke about some of the stores if you'd like, or choose to move on to lunch. 1:15 pm: Transfer between Arashiyama and Fushimi Inari, with a sushi lunch along the way. At about the midway point of the drive between Arashiyama and Fushimi Inari, we'll stop for lunch at a family friendly revolving sushi restaurant. Lunch is included in your tour price. Fushimi Inari, a momentous installation of red gates the scale up the mountain. It take 2 hours to get to the top, so you'll only go up partially, but back at the base. Be wowed by the temple structures and general ambiance. 4:00 pm: Transfer to your hotel in Osaka or Kyoto. Our guide, Kevin, was absolutely superb. His driving was flawless, and he was polite and patient. Moreover, he exceeded our expectations in every way. He was extremely knowledgeable about the tour itself and Japan in general, and he was wonderful at answering all our questions about Japan, and thoughtfully compared and contrasted Japan and the United States for us. The tour made us want to go learn more about Japan and Kyoto. All of the sites visited were beautiful and worthwhile destinations. A great day tour, especially the Kyoto part. Loved the Bamboo Fores and all else we saw. Lunch at a typical sushi bar where the locals ate was fun and interesting. I love everything about this tour! My personal guide is very friendly and shared us great history of each place. My mom and I really had a great time doing this tour. We really enjoyed it! Tour assolutamente consigliato..ottimo rapporto qualità/prezzo/distanze. Guida veramente preparata, sicura e disponibile, con automobile fantastica! Giornata indimenticabile.